We're excited to have Miranda Asebedo here to chat about her debut novel, THE DEEPEST ROOTS. Miranda, what scene was really hard for you to write and why, and is that the one of which you are most proud? Or is there another scene you particularly love? Okay, so this is a little spoiler-y, so don't read this if you don't want spoilers! But there's a scene in the book where Rome finds Lux after Lux has been attacked by her abusive stepfather. Rome's talent is Fixing things, so the first thing that trips her trigger as to something being off is all the broken things she feels on the other side of the door at Lux's house. This is when Rome knows that she has to call the police and report what's happening in Lux's family, even though Lux has forbidden Rome to tell anyone. It's a moment when Rome has to decide if she's willing to fracture her relationship with one of her very best friends in order to save Lux from harm. The scene where Rome finds Lux just rips my guts out every time I read it. I cried when I wrote it, and I still get teary when I read it. I originally pitched the THE DEEPEST ROOTS as "The curse of Maggie Stiefvater's THE RAVEN BOYS meets the strong female relationships of television's GILMORE GIRLS." There are curses and magic and a ghost(!) but also really strong female relationships, not only between the three best friends, Rome, Lux, and Mercy, but with mothers and neighbors in the community of Cottonwood Hollow. 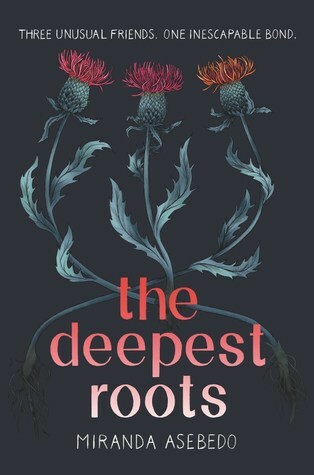 However, after reviews came out, the most common book THE DEEPEST ROOTS was compared to was Ann Brashares' THE SISTERHOOD OF THE TRAVELING PANTS. And I loved that book, and the movie, so of course I was really honored to be compared to it! The advice I would most want to pass along to other writers is to put value on your writing time. We're conditioned to believe that unless there's a dollar sign on every hour, like a day job, that our time isn't worth anything. But it is! And if you're serious about being a writer, you've got to see the worth in the time you can set aside for writing. And it's also really important for those around you see the value in your writing time as well, and understand that the time for writing is a necessity, not a luxury. I am very lucky to have a supportive family. When I was drafting and revising THE DEEPEST ROOTS (and later drafting my second novel, A CONSTELLATION OF ROSES out 2019 from HarperTeen), my husband would order Chinese food from our local take out place, herd our small humans, and let me lock myself up in my writing office for huge chunks of time on the weekends. He would actually sit in a chair outside my office and warn away anyone (or any dog) who wanted to come in and say hi while I was writing. Miranda Asebedo was born and raised in rural Kansas with a love of fast cars, open skies, and books. She carried that love of books to college, where she got her B.A. and M.A. in English, with an emphasis in Creative Writing and Literature. A Seaton Fellowship recipient, her short fiction has appeared in Kansas Voices, Touchstone, and Midway Journal. Miranda still lives on the prairie today with her husband, two kids, and two majestic bulldogs named Princess Jellybean and Captain Jack Wobbles. If Miranda's not writing or reading, she's most likely convinced everyone to load up in the family muscle car and hit the road. Have you had a chance to read THE DEEPEST ROOTS yet? Are you able to see the worth in the time you put aside for writing? Do the people around you value your writing time? Share your thoughts about the interview in the comments!